I've got a couple of these things out back, and while they are blooming to beat the band, they're also starting to overrun some of the deck and stairs. Is there a proper way to cut these back, or tie them off, or otherwise corral them? How far back can I cut them to ensure I get the crazy blooms I've got now, but still reclaim some real estate? It depends on the type of hydrangea because some have already created flower buds for next Spring; others have not; and other have but will still produce additional flowers later in the growing season. So if you prune the varieties that bloom on old wood, you will not get flowers in 2011. Do you know what hydrangeas do you have? For example, Macrophylla Endless Summer; Oakleaf Alice; Paniculata Limelight; Arborescens Annabelle; etc? How tall are they by the way? luis_pr wrote: It depends on the type of hydrangea because some have already created flower buds for next Spring; others have not; and other have but will still produce additional flowers later in the growing season. So if you prune the varieties that bloom on old wood, you will not get flowers in 2011. Do you know what hydrangeas do you have? 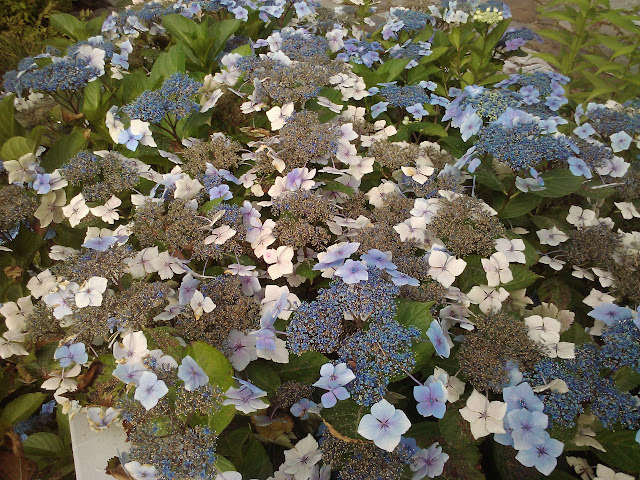 For example, Macrophylla Endless Summer; Oakleaf Alice; Paniculata Limelight; Arborescens Annabelle; etc? How tall are they by the way? They're taller than I am. I believe they are called "Lacecap?" They're still bloooming, although the blooms are fading to white. Got a picture right here. Very nice looking shrub! Probably a Hydrangea Macrophylla, although some H. serratas/asperas/arborescens resemble that look too. If this shrub blooms only once, assume that flower buds are developed around July-August so pruning now will result in no or few blooms in 2011. These are best pruned after they bloom in Spring but before the start of July. Pruning at other times will not hurt the plant; it simply results in fewer or no blooms during the next growing season. If this shrub blooms multiple times during the growing season, it is probably one of those new H. Macrophylla Lacecaps that is remontant. Like Twist & Shout or Summer Lace. You can prune these any time of the year although I would hesitate to prune if I notice that they are about to bloom of course. Just being practical. When pruning, prune to the first leaf node of this year's growth . Cut 1/2" to 1" above a budding node at a 45 degree angle. Stems can also be cut down to the crown/base if you wish. luis_pr wrote: Very nice looking shrub! Probably a Hydrangea Macrophylla, although some H. serratas/asperas/arborescens resemble that look too. So do you think it would be better if I just tied them back, and cut them in the spring, just to be safe? Sure. If you have chicken wire, you could see if that helps keep them within bounds. Some people use iron fences that are about 1-2" feet tall instead of chicken wire but I am not sure if they are available at this late time in the growing season. I have bought them at Lowes but do not remember seeing them lately; they may be sold out.